I was saving this ceditra entry for another day when I had more of a better introduction. I have been listened to The Nerdist podcast when on two occassions (Episode 43 with Chris Anderson of WIRED magazine and Episode 19 with Doug Benson), comedy films of days gone by were brought up in the conversation. Anderson spoke of how some movies he thought were funny back then don’t seem to hold up now and Benson spoke of how cool it was to watch Ghostbusters in a theater with an audience rather than at home via NetFlix. I was waiting for a third reference on The Nerdist regarding classic comedy on the silver screen before I published the following entry but with the news of the death of actor Leslie Nielsen, I figured that, surely, the time was right. My randomly chosen word from my dictionary is autopilot, a noun that means an automatic pilot. In my mind, the most famous (and fictional) autopilot is Otto from the movie Airplane! Otto was so famous in that comedy flick that he even received his own credit at the end of the movie. Personally, I find that movie to be seminal in what it meant to be a comedy movie. Yes, there were comedies before Airplane!, but this was a movie like Duck Soup, City Lights, or Kentucky Fried Movie that was a real game-changer for the genre. It almost seems a matter of faith for comedies now (whether on the big or small screen) to contain references to pop culture, have quick cuts, and be loaded with sight gags that double as puns. All these elements, I contend, were fused to perfection in Airplane! (and later in the televsion series Police Squad!). The likes of The Simpsons, Family Guy, Futurama, and any number of kids shows produced by Disney or Nickelodeon have all been a direct beneficiary of the genius that is the Zucker brothers and Jim Abrams. Because I am above a certain age, I am in that group of people who believe that nothing produced now is half as good as what came before. This most likely prevents me from seeing what the latest game-changer in comedy is. One could say then that I was operating on autopilot. Back to today and all I can say is thanks – it’s a word of gratitude, but that’s not important right now. I would like to take this opportunity and answer my own question that I posed in an earlier post where I wondered if anyone could name a person or group that has dominated the news more than the Tea Party when I suggested that that movement should be awarded TIME magazine’s Person of the Year for 2010. While I still believe that that movement, or a person closely associated with it, will be given TIME‘s honor, I have to admit that a strong contender for the award goes to WikiLeaks founder Julian Assange. With three high-profile releases this year of classified documents from the US war in Iraq, the US war in Afghanistan, and State Department, WikiLeaks has dominated the news with its practices, its methods, and what it has uncovered. 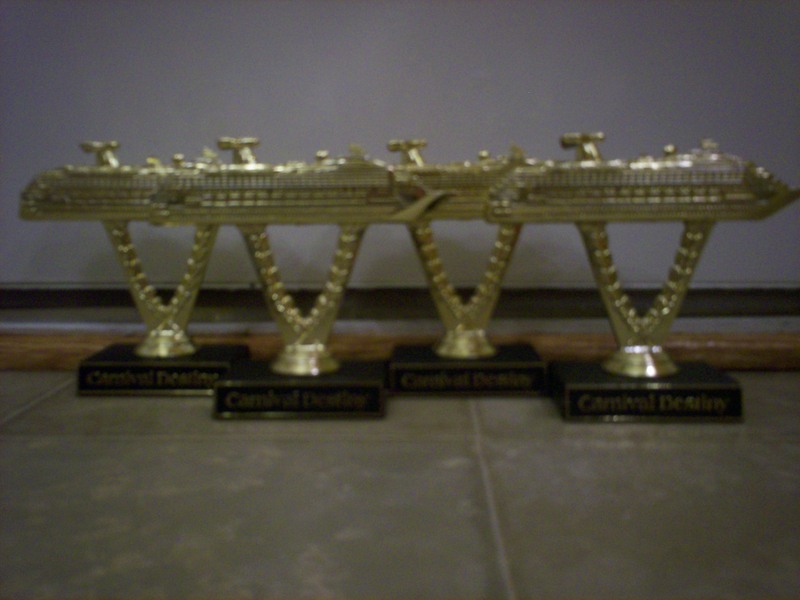 …to show that I won four (yes…count them…four) of the highly coveted “Ship On A Stick” trophies given out by the Carnival Cruise Lines for winning any of their on-board games and activities. My middle child, Jared, won his own “Ship On A Stick” for being a drawer on the winning “Win, Lose, or Draw” team. Ah, the acorn doesn’t fall from the tree, does it? and the poor scheduling of the nighttime activities (really…the big time song-and-dance shows had to be on the same night as the headlining comedians? ), but then…. So, all in all, I will gratefully hold my tongue, close my eyes, bow my head, and give thanks. Thirteen years ago (1997) this week, the world (okay, the United States only) was all agog over the birth of septuplets to a family that lived in Iowa, Kenny and Bobbi McCaugheys. There were TV stories, there were magazine profiles, and there were radio snippets all about this family. So, why, 13 years later as this group of children become teenagers, is there almost no coverage of them? A Google query of “+McCaughey +septuplets” returns (as of 4:20PM EST) only three hits. I believe this lack of coverage is due to inflation. Our appetite for large broods is no longer satisfied with seven which is why people are now fascinated by “Octomom” (8 kids), the Gosselins (8 kids), and the Duggars (19 kids). …maybe the lack of current coverage of the McCaughey family is due to the fact that the parents want to give their children as “normal” a childhood as they can and so they choose not to parade them in front of the cameras and microphones like a gaggle of trained circus animals. Has There Been a Coup? It’s no surprise Congressman Heath Shuler from North Carolina tried to overthrow Nancy Pelosi (CA) as leader of the House Democrats because when he was a quarterback for the Washington NFL team, he was always overthrowing his receivers (rimshot). I have written before about my middle child, Jared, comparing him to Cordelia, the youngest daughter in William Shakespeare’s King Lear and in comparing him to a kamikazee. I now offer my third installment about my 10-year old boy and his pedantic nature. …my boy is right. 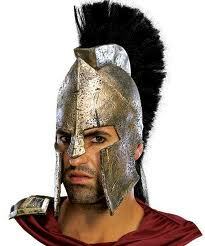 Helmets of Spartans seem to sport some sort of feature that guards part or all of the face (and most notably the nose). 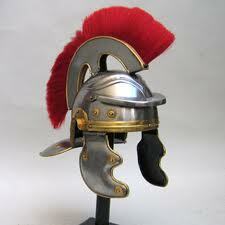 Roman helmets do not have this feature. 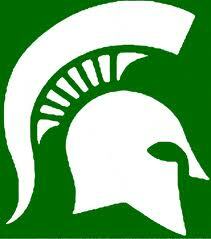 Now all Jared has to do is to petition the School Board to change the logo. It’s no wonder where this tendency of his comes from as I have been known to quibble over what the name of the federal holiday that falls in February is called.